The Keithley Series 2230G programmable, low-noise, three-channel power supplies deliver up to 375 W in a compact 2U high, half-rack-wide enclosure. 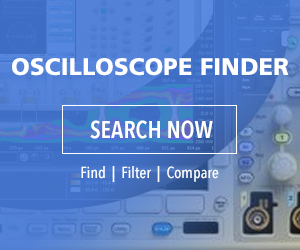 They are designed for accuracy and low noise when testing high power, multi-voltage circuits such as LED drivers, automotive, and power-IC circuits. The power supplies’ three channels are isolated, independent and individually programmable with remote sensing for each channel. The 2230G-30-3 provides 195 W with two 30-V, 3-A channels and a 5-V, 3-A channel, while the 2230G-30-6 and 2230G-60-3 provide up to 375 W, with two 30-V, 6-A channels and two 60-V, 3-A channels, respectively. Both 375-W versions also have a 5-V, 3-A third channel. For higher voltages or currents, 30-V channels can be combined in series to get up to 60 V, and two or three channels can be connected in parallel to deliver up to 15 A from the 2230G-30-6. All channels are simultaneously displayed on the front-panel display. To minimize the effects of noise on the device under test (DUT), the triple output power supplies use a linear design with <1 mV rms ripple and noise. The linear design also ensures the supplies don't add to ambient noise and affect other sensitive instrumentation being used for test. Using the supplies' remote sensing capability, the user can set and monitor output voltages with a 0.03% basic accuracy and a resolution of 1mV. Load current can be monitored to 0.1% basic accuracy, and 1mA resolution. The programmable multiple output power supplies include both front and rear access to the power outputs for orientation flexibility in test setups, while minimizing required lead lengths to reduce noise pickup, minimize losses, and keep the test setup neat. The 2230G Series come with three standard interfaces options for PC-based control: USB, GPIB, and RS-232. LabView and IVI drivers are downloadable from www.tek.com/product-support. The 2230G-30-3 30-V, 3-A, 195-W supply is priced at $1,390 US MSRP, while the 2230G-30-6 30-V, 6-A, 375-W supply and the 2230G-60-3 375W supply are both priced at $1,700 US MSRP.